Jozef [Joseph] Van den Berg (Beers, 22 August 1949 ) is a Dutch puppeteer, playwright and actor, who nowadays lives as a hermit. From the age of seven, he lived most of his youth at Cuijk, where his father bought an old rectory and tended an accountancy bureau. His father was a primary school teacher, first at Beers and then Rijkevoort, and a member of the resistance during the War. The family he belonged to consisted of eleven children. On January 30th, 1962, at the age of twelve, his father died and afterwards also his best friend Fritz. Already as a child, Van den Berg wanted to become a priest. For Christmas his mother gave him a set to play a little priest. At the age of 10, he played his first theater role as a Pharisee in a Passion Play of the Welpen at the patronage building at Cuijk. At the age of 13 he got a girlfriend, because of which the priesthood disappeared into the background. During his secondary school at the Internaat Bisschoppelijk College [Boarding School Diocesan College] in Roermond he was very active in school theater. For example, he played Sisyphus in the play Sisyphus And Death, and later on, inspired by Henk van Ulsen, with a lot of success Diary Of A Madman by Gogol. At the end of the 60's, after obtaining his high school degree, he passed his entrance examination and started at the theater school in Arnhem, which he quit after the second year. He went to live with Ruth in Arnhem and later on moved to Groningen. He applied for social assistance and started playing puppet shows. He borrowed a horse and cart and wandered around puppeteering. In this period he became member of the Gurdjieff movement. After a show in Groningen he got acquainted to his wife Hansje, whom he married on September 11th, 1973. They had four children: Lotte [nowadays a well-known playwright, theater actor and director herself], Maartje, Jasmijn and Jesse Van den Berg. In Groningen he lived on a farm and rented a basement at Zwanestraat where on Wednesday afternoon he played for children, and on Friday evening for adults. He started his professional career as a puppeteer in a puppet show and there he brought numerous characters to life. Eventually he removed the curtain and by doing so became the man with the puppets, visible for the audience. His improvisations were replaced by a play with a title. With a fire department truck, he played with a wandering puppet theater. Living in a mobile home, he brought his plays to the people. In 1980 he received the Hans Snoekprijs for Appeloog [Apple Eye], left Groningen and moved to Herwijnen in the Betuwe region. There he wrote Moeke en de Dwaas [(little) Mother and the Fool] for the Holland Festival. In 1980 and 1981 he played Moeke en de Dwaas, which was his great breakthrough. After this he played in Paris, the US and Japan. In this show he played a monk. His puppets were his family, consisting of - among others - Luke the monk, as if he had foresight, the materialistic and opportunistic Portemonnee [Wallet], the old, wise, strict Mrs. Witch, the ever rationalizing Mr. King, the melancholic Grootoog [Great Eye], the romantic neurotic Frederik the Bird, Pete the Caterpillar and Mannetje Pluim [(little) Man Feather]. In 1981 he received the CJP-Podiumprijs [Cultural Youth Passport's Scene Price]. A number of his shows were broadcast by the VPRO TV company. In 1983 the De Dwaas Foundation was established in cooperation with the Ministry of Social Affairs. The foundation was established by Van den Berg's technical assistant Gerrit de Beuze, who did his Civilian Public Service in order for him to be employed by this foundation. In 1988 and 1989, Joseph Van den Berg played his last show Genoeg Gewacht [Enough Waiting], which was a reaction to Waiting For Godot by Samuel Beckett. He wrote this play for his brother Aloys, who was seriously ill. He played this piece 80 times [constantly rewriting it] in the Netherlands and at a festival in New York. It was his ultimate quest and a testimony to his conversion. He drew his inspiration from the Stabat Mater by Vivaldi, sung by Aafje Heynis. Aloys Van den Berg, his brother, came to watch Genoeg Gewacht in a wheelchair. In 1988 his brother died of a brain tumor. On September 12th, 1989 was the Belgian première of Genoeg Gewacht at Antwerp [Belgium is a predominantly Dutch-speaking country]. That afternoon, Van den Berg had an encounter with God, as he described it later on. Sitting in his dressing room, he wrote a letter he wanted to use that night for the first time in his play. God asked him this question by his own pen: "Why don't you ever see that I cannot come because I'm already here." On September 12, 1989 he still played the premiere which later turned out to be his very last show. Van den Berg was - according to his own words - being called by God, and had to answer that. Before the evening show on September 14th, 1989 at De Singel Arts Center in Antwerp, he took his Bible and asked God what to do. He opened the Bible at the following words: "Go away from their midst and separate yourself" (II Cor. 6:17). A deadly silence followed, and the theater audience reacted emotionally. Thus, on September 1989 at 7:55 pm, the theater career of Joseph Van den Berg came to an end. In 1990 Van den Berg began a quest which would lead him to Maldon (Essex), Athens and the Holy Mountain of Athos, to further find out how he had to continue his road with God. His children and wife had difficulties understanding his conversion. An important event preceded his conversion: a woman he knew from the Gurdjieff movement died in a serious traffic accident, and she had pointed out that she wanted to be buried in the Orthodox way. This happened on August 17th at Eindhoven. There, he heard the Trisagion for the first time in Dutch. That's where he began to see that Gurdjieff wasn't right. 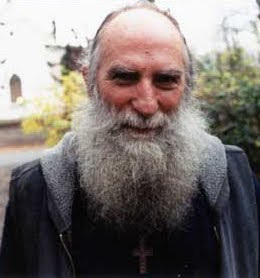 At the end of September 1989 he went to the Greek Orthodox Monastery of Saint John the Baptist at Maldon, Essex, England, where he talked with Elder Archimandrite Sophrony. At the beginning of January 1990 he had a very important meeting in Athens with the Greek Elder Porphyrios. This last one confirmed the experience God had given him in Antwerp, and he told him that he has to now to become an Actor of Christ. He was sent by Father Porphyrios to the Holy Mountain of Athos, where he had a meeting with Father Paisios. After returning to the Netherlands, and loyal to the word of Father Porphyrios, he began to work on a new family show titled The World Turned Upside Down, where he wanted to convey his new faith. But it seemed that everything was going wrong, and he got in more and more spiritual trouble. He couldn't sleep anymore and became over-tired. In the middle of this crisis, on June 18, 1990, he asked a priest in order to be accepted into the Orthodox Church. Meanwhile, 40,000 tickets had been sold for his new show. Notwithstanding this, nothing whatsoever came out of his hands. In August, overstressed, he was treated for five weeks at the Psychiatric Centre Nijmegen at the Heilige Land Stichting [Holy Land Foundation]. There was to be no new show. Because of this, peace slowly returned to him and thus he began to write a new piece called The Meeting, in which he wanted to share with his audience what happened to him in Antwerp. In April 1991 he went to Athens again, to Father Porphyrios, to ask his blessing to play his piece The Meeting. However, he didn't manage to speak to him, due to his old age and illness. After this, he went to the Holy Mountain of Athos for three weeks, to work on his theater play in the Monastery of Grigoriou. Having returned to the Netherlands, things evolved in a different way than expected, among other things, because of a subsidy by the Ministry of Culture. At the request of the board of the Foundation De Dwaas, of which Van den Berg had become an employee, he formulated a new mission statement for this Foundation. On May 21st, 1991 he announced this new goal at a board meeting: "The support and promotion of all theatrical activity, in the broadest sense of the word, which expresses the spirit of Christ." The board and the Ministry of Culture couldn't reconcile themselves with this and the subsidy was revoked. But once he established it, he didn't let go of this goal. Thus, unexpectedly, the whole project came to an end. Gradually, Van den Berg began to realize that he would never play The Meeting either. The authorities assumed that he was confused again, and he was declared incapacitated. During the night of the 1st to the 2nd of June, he realized that he was left alone, and on June 2nd, 1991 he attended the Divine Liturgy at the [small Orthodox] Monastery of the Holy Prophet Elias at St. Hubert. That's where he left what was left of his money on the collection plate. "Lord, from now on, You have to take care of me. I totally surrender." There, Archimandrite Pachom read from the Gospel of that Sunday of All Saints: "He that loves father or mother more then me, is not worthy of me: and he that loves son or daughter more then me, is not worthy of me. And he that takes not his cross, and follows after me, is not worthy of me. He that finds his life, shall lose it: and he that loses his life for my sake, shall find it" (Matthew 10:37-39). Two hours later, after the Liturgy, he went straight to the Orthodox Monastery of the Nativity of the Theotokos near Asten, where he stayed for 19 days, and where he left his Mercedes Combi, because it didn't want to start again. On June 21st, 1991 he put a final end to his theater career at his first try-out, never to be played again, of the show The Meeting in the Streekschouwburg at Cuijk. On June 24th, 1991 he left his home by bicycle, but his tire ran a flat near Waardenburg, so he passed the night at Juke Hudig's, an artist at Neerijnen. On June 25, 1991, having repaired his bike, he left Juke Hudig, and cycled into the province of Noord-Brabant, to the south. He wanted to drive into the Brabantine land and the entire world. But soon enough he understood intimately that this was not God's will, and returned to Neerijnen after one night in Eindhoven. On June 30th he collected two or so theater attributes he used in his performances from his house. After this, he returned to Juke Hudig. His only question was: "How does God want me to shape my calling?" Then, he intimately saw that he had to collect his puppetry box. On July 9th, 1991 he collected the box at his house at Herwijnen, and walked it 15km further to Neerijnen. Having arrived at Neerijnen with his theatre box on wheels, with a Russian cross attached to it, he understood ever more clearly that he had to stay there. During the month of July he stayed for three days on a farm at Neerijnen. On August 1st, 1991 he moved to the bicycle shed of the Neerijnen Town Hall, where he started his public calling. After fifty days, he retreated from publicity and lived nine months in seclusion at the home of an inhabitant of Neerijnen. In June 1992 Joseph returned to the bicycle shed and stayed there, even during the winter. In December 1992, he built a small chapel around his box. On November 1st, 1993, Van den Berg had to leave the bicycle shed on orders of the Neerijnen town council. Two pupils of Neerijnen Elementary School offered the mayor a petition on behalf of the townspeople who thought that he should be able to live on at the shed, but this was of no avail. The [National Public TV-Company's] Youth News followed the youngsters' action and was also present on Monday morning November 1st. On Monday afternoon Joseph decided to collect his belongings, and left the bicycle shed. Co-townsman Harm Hazelhoff had previously offered him room in his garden, under the quince tree, but inwardly Van den Berg didn't understand yet that he had to accept that invitation. On Monday evening he returned with his belongings to the bicycle shed. During the night of the 1st to 2nd of November, God showed him that he had to be humble and leave the bicycle shed after all. On Tuesday he put his suitcase and other belongings under the quince tree in Hazelhoff's garden. That same afternoon, someone passed by and told him that De Pleisterplaats [Pull-Up] was his best show. There were four poles close to the quince tree, and Joseph understood from this that he had to build the "Pull-Up" under the quince tree. With this "messenger", he built a small chapel of 2 by 1.5 meters, which still stands today. He still lives there, and receives people every day. He lives from whatever people bring him. He has no connection to any utility whatsoever. Since a couple of years, there is a toilet in the castle garden, which Joseph and his guests can use, and since a few years he has a mobile phone for emergencies. Joseph Van den Berg gets a lot of attention from the media because of his extraordinary way of life. The attention of the media never wanes, even after his theater career. Since the start of his calling, the Dutch national newspapers, magazines, TV companies, radio and weblogs publish at least one article about him every year. In 1993 he was interviewed by Rik Felderhof for the NCRV TV program De Stoel, and by Fred Wittenberg for the KRO radio program Radio Ararat. In 1995 he got interviewed for the NCRV program Rondom Tien. In 2001 he was visited again for De Stoel. In 2003 Arjan Visser arranged a radio interview with him for Spiegels (RVU). In 2005 he was visited by Martin Simek for the Christmas night broadcast of Šimek’s Nachts (RVU) and in 2006 there was a radio interview by Friedl' Lesage in Het beste moet nog komen for Radio 1 (Flanders, Belgium). Omroep Gelderland dedicated a number of programs to him. In 2007, Auke Hamers recorded the short movie Ik Speel niet meer [I don't play anymore], about his life and religious convictions. In 2010, the TV show Man Bijt Hond made a short portrait of Joseph Van den Berg. Note 1: During an interview with the Belgian "top" newspaper De Standaard (www.standaard.be), Jozef Van den Berg told an interesting story. A man wanted to have a date with a woman he hadn't met or seen yet. The woman agreed on condition that the man would buy her flowers every week. This seemed strange, demanding and even somewhat arrogant to the man, but eventually he agreed. However, when they met, the man was so overwhelmed by her beauty, intelligence and character that he told her he would buy her flowers every day. To Jozef Van den Berg, the same is true for God. Note 2: Jozef's daughter Lotte Van den Berg, for the past couple of years a famous director and playwright herself, wrote her first major theater play "Winterverblijf" (Winter Home/Residence) about her struggle with her fathers conversion. The show played in all the great theaters in the Netherlands and Belgium. This is how it was introduced: "She found her inspiration on a journey through Siberia and Mongolia, where it is too cold to heat the church during the winter, and the celebration of Liturgy forcibly has to be moved to the kitchen or the barn. According to Van den Berg herself: 'The show will treat people who hope to believe. It is about people who shape their non-understanding, say a prayer or sing a song. Maybe every act is a prayer and an attempt to attach yourself to the world around you.'"